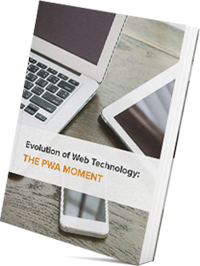 This document provides an overview into different stages of the evolution of web technology since its advent. As the way users interact online is ever changing, the web technology radically evolves to reflect the shifting user interactions on the web. Early adopters of the latest advancement are more likely to outperform their competitors, as the technology makes its way into the mainstream. We’ll take a look at the emerging technology that revolutionizes the web today and how businesses can take advantage to boost website performance and gain a competitive edge.